Minigame logo, seen in New Super Mario Bros.
A minigame (sometimes formatted as "mini-game") is a short game which may reward coins, items, or higher scores. However, some main games may require completion of a minigame to access a new area or gain a key. The most common form of minigames is from the Mario Party series. The Mario Party series has many types of minigames. Most award ten coins while some award items. 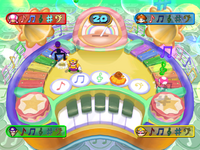 In Mario Party, a few minigames can cause a player to lose coins, although this system was changed in later Mario Party games. Since Mario Party 2, players can now practice minigames before trying them out for real. Originally featured in Mario Party, 1-player minigames are minigames played alone. These minigames are usually accessed by landing on the Minigame Space. If the player fails, they lose 5 coins; but if they win, the player wins 10 coins, unless it is a different kind of minigame, like Whack-a-Plant, where players cannot win or lose. 1-player minigames reappear in Mario Party 8, now called Challenge Minigames. If the player wins, they get to spin the wheel to throw a dart to collect the number of coins on the platform the arrow landed on. However, if the player loses, they cannot throw the dart and their turn ends. A challenge minigame is triggered when a player lands on a Challenge Space. The three challenge minigames are Pour to Score, Stampede, and Fruit Picker. 1 vs. 3 minigames are minigames that challenge a single player against the other three. They typically come in three forms, the three players trying to take down or hinder the single player, the single player trying to take down or hinder the other three players, or both the single and three players trying to achieve a similar goal, with the single player usually getting some form of advantage. In Mario Party 9, they are called 1-vs.-Rivals minigames. 2 vs. 2 minigames are minigames that have the player paired-up with another player. Players often need to work together and cooperate to beat these games. Mario Party 9 is the only Mario Party game (not counting Mario Party Advance) not to feature this category of minigames, but Shell Soccer qualifies as a 2 vs. 2 minigame. Item minigames are games that a player can play to get an item. They are triggered by landing on an Item Space. If the player gets Baby Bowser, they get nothing. They only appear in Mario Party 2 and Mario Party 3. In Mario Party 2, the minigame played depends on what board is played on. In Mario Party 3, the Item Space may trigger a roulette to decide a minigame to be played. The below table displays information pertaining to which board has which item minigame is played in which board in Mario Party 2. Western Land Give Me a Brake! Bowser minigames are Bowser's own minigames. 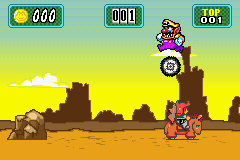 Bowser minigames are often extremely unfair to the players, as Bowser makes all the rules. Bowser minigames are also similar to 4-player and 1-vs-3 minigames (where the 1 is the player who lands on the Bowser Space), except that they produce a loser instead of a winner. The loser can lose Coins, Stars (if they have one, or more), or Items. In Mario Party, Bowser Minigames are minigames where players compete against each other in a 4-player or 1-vs-3 minigame where each player that loses must hand over somewhere between 10-50 coins. If there are no losers due to the game not ending in the time limit, then Bowser steals coins from everyone. In Mario Party 4, Bowser Minigames are minigames where players compete against each other and the one player who messes up loses. The loser loses either half or all of their coins, or all of their items. Also in Mario Party 7, there are single-player Bowser minigames where the one player who lands on the Bowser Space has to do various things to collect a key to escape from a dungeon before a time limit runs out. The penalty for losing is the same as in the Multiplayer Bowser minigames. In Mario Party 9, Bowser's Minigames are referred to as Reverse Minigames where the player has to lose in order to win Mini Stars. In Mario Party 10, Bowser Minigames are referred to as Bowser Battles. If someone loses, they lose Hearts. Reverse Minigames from Mario Party 9 also return in this game. If someone loses, they will win twenty Mini Stars. Introduced in Mario Party 5, Donkey Kong minigames are minigames run by Donkey Kong which are often short. They usually have players focus on collecting as many bananas as possible. After the Donkey Kong minigame is finished, players can trade their bananas to Donkey Kong for coins. They can also gain more depending on the DK Roulette. First appearing in Mario Party 2, duel minigames are minigames that involve two players playing a minigame against each other. Most usually have high stakes. They are the only type of minigame in any 1-vs-1 game mode. The challenging player can choose to either play for coins or Stars. This is provided that the challenging player himself has enough to wager. From Mario Party 7 onwards, the winner's prize is decided by a roulette wheel. Mini Mini-Games are a type of minigame in Mario Party 4. It can be played only by a character that has the effects of a Mini Mushroom via Gates that lead to secret passageways on all of the boards. There are two types of Mini minigames, those that involve winning items, like Item-Go-Round and Item Poker, and those that involve winning coins, like the Coin Slots and Tropical Fishing. The themes are usually paired with the theme of the board (such as Goomba Poker and Card Matching on Goomba's Greedy Gala). Battle minigames are minigames that take coins from all the players, then gives them back in different amounts based on the results. The amount of coins taken can go from 10 (later 5) to 50 coins per player. Unlike other minigames, the rank order is important – a player can still win some coins for being in second place. Like the 4-player minigames, most minigames are evenly matched between the four players. In Mario Party 2, Mario Party 3, Mario Party 4, and Mario Party 9, battle minigames are played when a player lands on a Battle Space. From Mario Party 5 until Mario Party 8, battle minigames are not triggered when landing on any particular space (except for landing on a Battle Space in Mario Party 6's Solo Mode), but instead played at the end of a turn, like a normal minigame. The Battle minigame is only played if all four players' combined dice roll for the turn is a multiple of 10. Here, players are able to vote on which battle minigame they want to play, out of a list of three battle minigames. The minigame that gets the most votes after each player has voted is the one played. If there is a tie in the votes between two minigames, the minigame with no votes is played instead. If the total number of coins is not a multiple of 10, one random player gets a bonus coin. Also, if a player lands on a Bowser Space the players can be forced into battling for half of each player's Mini Stars. However, Bowser keeps any left over Mini Stars. 8-Player minigames are minigames only in Mario Party 7. They are played with eight players, in four teams of two. With the Nintendo GameCube not having eight controller slots, this must be done by having four controllers plugged in and each player sharing half of the controller. The first player of each team uses and while the second player of each team uses and . They are only accessible in 8 Player parties. 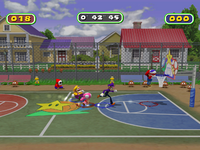 Mario and Toadette competing against Waluigi and Wario in Dunk Bros. Introduced in Mario Party 3, rare minigames are special minigames that do not appear at all in normal Party Mode. They are sometimes very long and have special options that other minigames do not have. Featured in Mario Party 9, Bowser Jr. minigames are only played when landing on a Bowser Jr. Space. These minigames involve two players, a captain and a partner competing against Bowser Jr. If the players win, they get 5 Mini Stars each. If they lose, Bowser Jr. steals 5 Mini Stars each. They also appear in Mario Party 10. They can only be activated by selecting them from Bonus Games or landing on an event space on Bowser's Board in amiibo party. Players who win get 10 coins or a Star, and players who lose must pay 10 coins. Unlike Mario Party 9, players who face Bowser Jr. do not receive a partner. Appearing in Mario Party 9, Mario Party 10 and Mario Party: Star Rush, Boss Battles are played when the players reach a Boss Battle Space. Each board features two bosses. In these minigames, players must defeat an enemy by working together (except in Diddy's Banana Blast and DK's Banana Bonus), though each one tries to get more points than the others. These minigames have no time limit and end only when the boss health meter is empty. When half of the health meter is empty, the boss develops more diverse ways to attack. Whoever lands the final hit on the boss will receive bonus points. Mario Party DS also features Boss minigames, though they are one-to-one showdowns. In Mario Party: Island Tour, Boss minigames can be played in Bowser's Tower and are also one-on-one. A category only found in Mario Party 8, only one minigame appears in the Last category, Superstar Showdown, which is played at the end of Star Battle Arena. 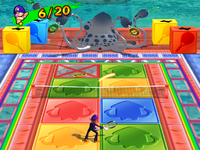 The minigame plays out similar to the Boss minigames in Mario Party DS and Mario Party: Island Tour, as it involves the player fighting against Bowser one-on-one. Mario Party 7 has the most minigames, at 88 minigames (not counting Mario Party: The Top 100, which is a compilation of 100 returning minigames). Unless Mario Party-e is counted, which is a card game that utilises the e-Reader for short minigames, Mario Party and Mario Party Advance are tied at last place with the least amount of minigames, at 50 minigames. The second-to-last is Mario Party: Star Rush, with 53 minigames. A total of 923 minigames are found in the Mario Party series, including returning minigames in Mario Party 2 and Mario Party: The Top 100. In addition to its trademark short microgames, the WarioWare series feature a small number of long-form minigames in each installment, which are played separately from the microgame sets and take the form of either simple endless games where the goal is to improve own's high score or simple competitive multiplayer. They are typically unlocked by beating a score target in the character stages, which is indicated in the character's story mode description. They are accessible from "Games" category of souvenirs. All minigames are unlocked by progressing through the game, with the exception of Pyoro S, which requires unlocking every microgames. Super Mario 64 DS features a grand total of 36 minigames (mini-games), which are divided among the game's four playable characters. Two of each character's minigames are unlocked along with the characters themselves, while the remainder are unlocked by catching Rabbits. All of the minigames utilize the DS's touch screen. Luigi specializes in "table" games, also known as gambling games. This is also a reason the Virtual Console PAL re-release of Super Mario 64 DS got a PEGI 12+ rating. Wario has the most diverse collection of minigames, almost no description applies to all of them. New Super Mario Bros. features minigames in much the same vein as Super Mario 64 DS. Some of the latter's minigames are copied exactly for the former; however, most of the minigames are new, and many are multiplayer, something never seen in Super Mario 64 DS's games. Most of the minigames' HUDs also have most of the characters lowercase. These are scattered across the galaxies. These are scattered among the different kingdoms. 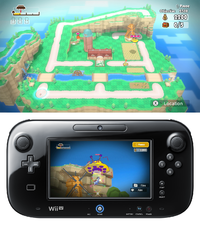 Game & Wario is a game for Wii U that has 16 minigames. These games usually try to showcase the Wii U GamePad's capabilities. All of their titles are based off of how the original Game & Watch's games had one name. Mario and Donkey Kong: Minis on the Move is a Nintendo eShop for Nintendo 3DS that has four minigames. These minigames use the stylus on the bottom screen. ¾ of these minigames launch an object on the play area. In Paper Mario: The Thousand-Year Door, there are four minigames in the Pianta Parlor. These games require a certain card to play each one. In Super Paper Mario, these minigames are found in the arcade on floor B1. The first three are unlocked from the start, costing 10 Flipside Tokens, while Hammer Whacker can be played once getting a golden card from Flopside. This mini game costs 20 tokens. In Paper Mario: Sticker Star, there is only one minigame located at Stump Glade. Minigames are found in various places in Paper Mario: Color Splash. In Mario & Luigi: Dream Team, there are total 4 minigames found in the Pi'illo Island. Battle Mode, Mario Kart series equivalent. This page was last edited on April 14, 2019, at 21:38.